In this age of increasing demand for high-performance contracts at home and abroad, the Government has failed to develop a strategy for how to properly recruit, retain, and train the contracting workforce. Many of the contracting careerists who entered the Government workforce in the late 1970s have seen the career field go from large to small, requirements from simple to complex, and demands increase exponentially. At the same time, Congressional involvement has gone from occasional to constant, laws affecting the workforce and ethics have gone from few to many and the average age of the workforce continues to rise. 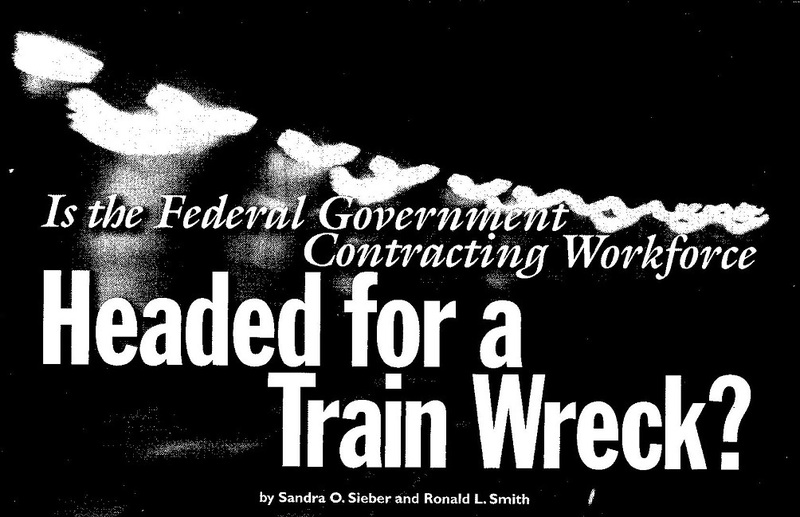 The increased privatization of Government functions has resulted in substantial complex service contracts for almost every type of work the government performs. These privatized or outsourced functions- in many cases became large-dollar, long-term, and highly complex contracts driving the need for more contracting personnel (and more sophisticated skills) to award and administer these functions. Yet, since this increasing complexity has occurred gradually over time, there has not been a corresponding strategy for how to recruit, retain, and train the workforce to lead the Government effectively into this new age of privatized Government functions. "More than half the senior managers in Federal departments will be eligible to retire by 2008, and not enough experienced middle managers are available to replace them. This looming retirement exodus, coupled with the fact that fewer young people are choosing public service as an entry-level career, forms a recipe for managerial disaster. " USA Today is hardly a contracting trade publication. This editorial is good evidence that this issue is so pronounced and so publicly recognized that all Federal organizations, including contracting organizations, should take notice and take action. There is a strong body of analytical studies to quantify the challenges affecting the Federal government generally. The specific contracting data provides compelling evidence of the effects of environmental and organizational change on the profession across the past decade. 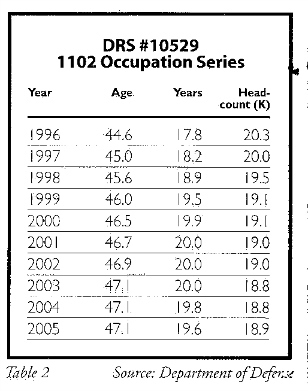 The workforce change has been gradual. validate and quantify the risks. As shown in the chart above, these chances do not represent an alarming or catastrophic trend, provided that the workload, process complexity, and other factors were stable over the same period of time. However, the external environment across the 10 years from 1996 to 2005 has been anything but stable, with major defense deployments across the world, including continuing conflicts in Iraq and Afghanistan. Similarly, the demands on the corresponding civilian workforce, including within the Department of Homeland Security, have been extraordinary, ranging from September 11, 2001, to Hurricane Katrina. The increase in contracting dollars and actions is shown below. 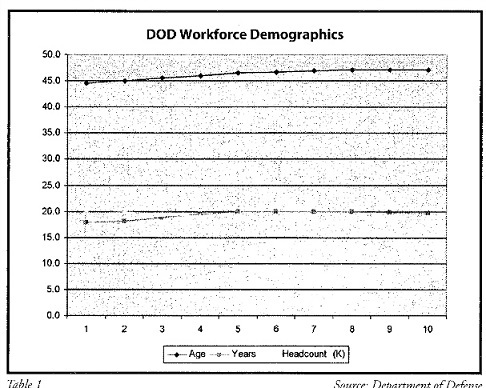 During this period, the DOD workload per person nearly doubled, from $6.4 million per 1102 staff to almost $13 million each. Part of this change is due to economies of scale and efficiencies in the system, but the dominant factor is the scale of the procurements.While the number of contracting actions has remained relatively the same over this period, contract complexity has risen significantly, as have the dollars awarded. Among these complexity factors are the move from sealed bids to complex "best value" awards, the mandate to evaluate “past performance," and the move from detailed Government specifications to performance-based criteria. As the average dollar value of individual procurements has risen, so has the amount of time and effort required to document, approve, and administer the typical contract. The risk of error (in pricing, source selection, or other factors) in the system is unquestionably increased by the workload strains within the current contracting system. Later in this article we will cite numerous examples of negative press coverage of the mistakes (and perceived mistakes). Further on we will worry aloud whether the profession is better served to address these qualitative issues internally versus waiting for the press and the Congress to "reform' the system on our behalf. But, first we should examine the current experience levels and qualifications within the existing, depleted workforce. We have one Federal government civilian personnel system, yet we have laws that apply to the qualifications, training, and education of defense procurement personnel, and others that apply to the qualifications, training, and education of non-defense Federal procurement personnel. There is a standard for certification of contracting professionals that requires completion of Government courses that only Government personnel (in some cases defense only) can take, while talented individuals in mid-career from private industry or a civilian agency are hampered in their attempt to enter this workforce because they were unable to attain equivalent credentials. External factors, including Iraq, Afghanistan, and Katrina. The overall effect of these events has been a net loss in efficiency and effectiveness of contracting processes. Notwithstanding the acquisition reform focus on mission-effectiveness rather than job-reduction, the emphasis on “streamlining" explicitly promised greater efficiencies. In anticipation of these efficiencies, Congress dramatically downsized the Federal acquisition workforce. Congress also instituted reforms in related professions and organizations to gain further efficiencies and cost savings.  The largest economic recovery effort in American history. stakeholders, including Congress and the public, need to be informed and engaged to gain support for needed changes. Unfortunately, press coverage is singularly uninformed and generally focused on bad news and perceived problems. Press commentary on the profession is generally critical and frequently presented in such condensed and imprecise form that the underlying facts are impossible to decipher. The press conclusion is negative, but the facts are absent. To the professional eve, there are two distinct sets of contracts related news stories.  Coverage of individual acts of malfeasance. Within the past year, senior officials at OFPP and the Air Force have been involved in ethics scandals. These events continue to unfold. Former Air Force official Darlene Druyun recently completed her term in prison. Former OFPP administrator David Safavian was found guilty of ethics violations. The actions of these individuals provide a perception of scandal and impropriety to the larger issues affecting the profession.  Coverage of the profession generally. As conflict in the Middle East continues, multiple contracting news stories have emerged. These include allegations of impropriety in the award and performance of defense contracts. This coverage has accelerated as Federal agencies award contracts in response to Hurricane Katrina.  "FEMA Contracts Raise Questions"
Based solely on this reportage, the natural public and governmental reaction would be to impose additional rules, regulations, and restrictions on the profession. There is no indication that the media will explore anv root causes of the inefficiencies inherent to the current stress on the procurement system. Instead, the natural reaction will be to commingle the issues of ethics with issues of efficiency and conclude that the contracts profession should be subjected to further rounds of regulation and micromanagement. It seems that the KISS (Keep It Simple Stupid) principal is called for here. The workforce is short of seasoned, properly trained, and educated staff. The National Contract Management Association (NCMA) has long had a contracting certification program, the Defense Department has a contracting certification program, and the civilian agencies have a certification program. None of them are considered equivalent to the others. Colleges and universities have certificate and degree programs in contracting, but few of their courses are accepted in lieu of agency-mandated training. and out of Government service, and between Federal agencies at various levels with a standardized set of criteria? It starts with standardization of Congressional legislation. Then the implementation of laws by various Government agencies needs to be consistent and complementary. Perhaps it is time for a Section 800-like panel on contracting workforce legislation, and standards to streamline requirements and make them applicable to all, and equivalents to be identified for private industry professionals who wish to enter the field in mid-career. Such an initiative would provide long-term consistency and continuity to the contracting workforce. 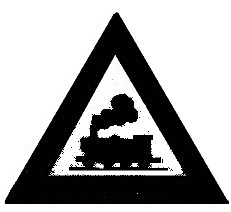 Regardless of the long-term goals adopted, there are three immediate actions needed to avoid the coming train wreck. First, increase the size of the Federal procurement workforce. Considering the greatly increased workload over the past decade, the concurrent reductions in the staffing of this function, and the critical missions required today, increased resources are needed. to recent college graduates. These efforts should include allowing existing authorities to attract the "best and brightest" including recruitment and relocation bonuses, and stepped- up grade and within-grade initial hiring salaries. Similar efforts have been used successfully in the recent past for other critically short Federal career fields, such as science and engineering and should be applied to the contracting career field. government. This would attract mid-career and senior contracting professionals to enter the Federal workforce from industry. and enable Federal agencies to meet today's critical mission requirements. Faced with critical missions both at home and abroad, we must recognize that "right-sizing" today means enough contracting professionals and the right skills to do the job right. RONALD L. SMITH is a director of the National Contract Management Association (NCMA). The views expressed herein are his individual views and are not those of or made in any capacity on behalf of either NCMA or his employer; GovConnection, Inc. This article, originally appearing in the electronic newsletter of the National Contract Management Association (NCMA) is reprinted with permission from NCMA ( www.ncmahq.org ). In addition, a shorter version of this article ("A Lot to Learn," page 69) ran in the Mav 15, 2006 issue of Government Executive Magazine (www.govexec.com ).